Perfect travel or rainy day activity. Great to carry to school or for vacation. Includes a nylon and pvc backpack and 6 permanent markers. 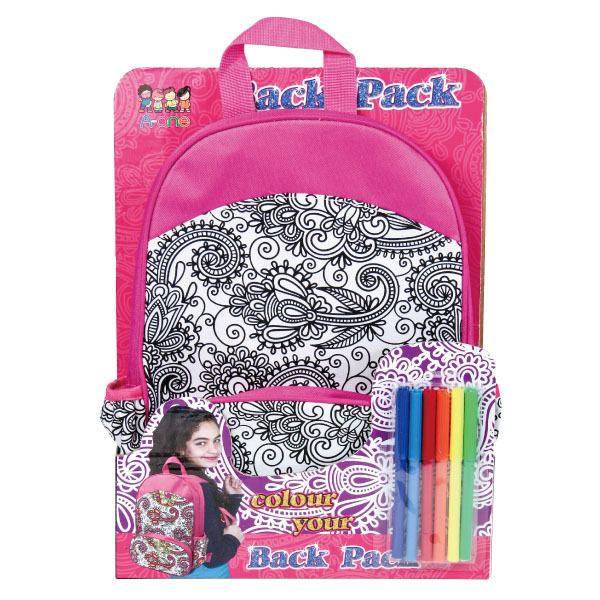 Education, Learning Experience Fun and interactive for the entire family Makes a great gift and is a fun activity for parties -show off your very own style Another way for your child to expand their imagination 600D polyester. Fashions You Color bags are a trendy and exciting way to show your style. It's stylish pattern can for you to color any way you want! The marker ink spreads on the bag fabric and feels like painting. The lines on the bag are thick and provide mess-free coloring. This backpack is perfect for store stationery and travrelling because it's big size!